Inventor Bernard Bar-Natan, who immigrated to Israel from New York City, gained his knowledge of wound dressing while serving in an IDF infantry unit. Bar-Natan’s “Emergency Bandage” dovetails with a new approach the American military has adopted to treating its wounded. While in the past injured soldiers were commonly evacuated, the U.S. “now believes that immediate treatment on the battlefield saves lives”. Soldiers in Iraq are currently trained to treat their own wounds before help arrives. A wounded soldier may apply the Emergency Bandage himself, using only one hand if necessary. Following the U.S. lead, the Canadian military, the French Army and the Belgian army have also bought the Emergency Bandage. In addition to its military applications, the bandage, which stops potentially fatal bleeding and can also be used as a sling, has been used by civilian emergency-care providers and hospitals throughout the world. 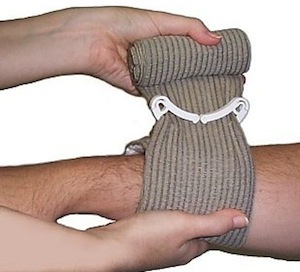 Taking the improvised rock technique as a model, the elasticized bandage has a pad and a pressure bar that allows soldiers to wrap the wound once, twist the bandage, and rewrap the wound in the opposite direction. Re-wrapping is particularly useful in bandaging complex injuries to the groin or head.